During development of the nervous system, as many as half of all neurons generated are subsequently eliminated by a process called programmed cell death. Though counterintuitive, the selective death of neurons at specific times during development is critical for sculpting a properly wired nervous system. Much of this cell death occurs as newly differentiated neurons compete for limiting amounts of survival-promoting, or “neurotrophic,” factors. While programmed cell death is a normal part of development, too much or too little cell death later in life is a confounding factor in diseases ranging from Alzheimer’s disease and stroke to brain cancer. Research in this laboratory is aimed at characterizing the mechanisms that regulate cell death in the mammalian nervous system. More specifically, we aim to identify and understand the critical cell signaling events that, if left unchecked, will commit a neuron to die. Our basic approach involves comparing gene expression and protein function in neurons before and after exposure to a death-inducing stimulus. For example, to study programmed cell death during development, we use a model in which neurons are deprived of the neurotrophic factor nerve growth factor. Using this model, we have discovered new roles during cell death for two proline-modifying enzymes, the prolyl hydroxylase EGLN3 and the peptidyl-prolyl isomerase PIN1. 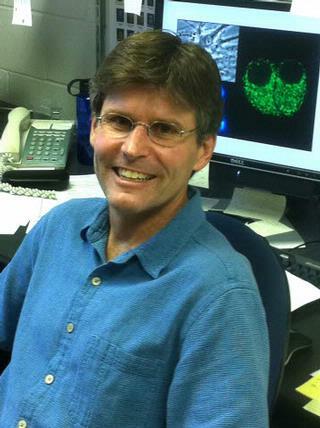 Using techniques and approaches from cell and molecular biology, genetics, and biochemistry, we are (1) determining the effects of knocking out these proteins on cell death during development and disease, (2) identifying their biochemical targets and substrates, and (3) characterizing the pathways that regulate their function in dying neurons. A second interest of the laboratory concerns the mechanisms by which oxygen availability regulates the survival of developing neurons. Prenatal or perinatal hypoxia (low oxygen) and hypoxia-ischemia (reduced oxygen and blood delivery) are important causes of neonatal brain injury and abnormal brain development. To better understand these processes, we are investigating the regulation and function of the hypoxia-inducible factor (HIF) family of transcription factors in neurons exposed to different oxygen tensions. Ultimately, our research efforts are driven by the prospect that the mechanisms we uncover may ultimately contribute to the development of new therapies for cell death-related diseases and disorders of the nervous system. The Mixed-Lineage Kinase Inhibitor URMC-099 Protects Hippocampal Synapses in Experimental Autoimmune Encephalomyelitis. ; eNeuro; Vol 5(6). 2018 Nov.
Dual phosphorylation of Ric-8A enhances its ability to mediate G protein α subunit folding and to stimulate guanine nucleotide exchange. ; Science signaling; Vol 11(532). 2018 May 29. JNK2 and JNK3 are major regulators of axonal injury-induced retinal ganglion cell death. ; Neurobiology of disease; Vol 46(2). 2012 May. Protein S blocks the extrinsic apoptotic cascade in tissue plasminogen activator/N-methyl D-aspartate-treated neurons via Tyro3-Akt-FKHRL1 signaling pathway. ; Molecular neurodegeneration; Vol 6. 2011.